If you’re vacationing in Jasper National Park, you’ll find an unbelievable range of choices for vacation activities. Jasper’s got everything for a perfect Canadian Rockies vacation, rafting, hiking camping, and some great mountain biking trails. 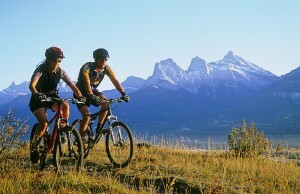 The Canadian Rockies are excellent for mountian biking vacations. Mountain biking Jasper is one of the best ways to see the beautiful country here, cover a lot of ground, and have great vacation fun, whether that be a family, friends or a business partners on a corporate retreat. 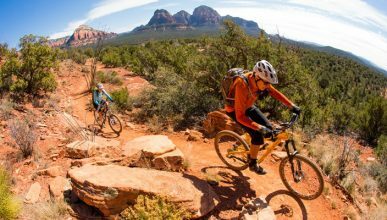 Below you’ll find a quick guide to Japser’s mountain biking trails. Trail guide: Find the trail head on the west side of Jasper just before The Cabin Creek West subdivision. Take the trail leading from the parking lot on the left. The trail takes you uphill, following a low ridge with nice views of the Athabasca and Miette Valleys.After From High Lakes to Saturday Night Lake you’ll find swampy sections, but from there to Cabin Lake is easy riding. After Cabin Lake, ride along the fire road to the intersection with Pyramid Lake Road and take a right to return to Jasper. This ride starts at the Old Fort Point the trail, and goes behind the beautiful golf course at The Fairmont Jasper Park Lodge. The first 12 km have some solid uphill segments that’ll get your blood flowing. Remember, no bikes between the first and fifth bridges on the self-guided trail at Maligne Canyon. Avoid this by riding down Maligne Road to the Fifth Bridge turnoff 3 km below. Cross the bridge and pedal to Trail #7 on the far side. Take a left to Sixth Bridge and continue along the trail runs beside the Athabasca River to Old Fort Point, or head back to Jasper along Highway 16. Trail guide: You’ll start at the parking lot opposite Japser’s Aquatic Center. The trail climbs steeply to the left, then intersects with the Cabin Lake fire road. Cross the road and pedal past a big pond continuing on to Mina Lake. At about 3.5km from the lake a marked trail leads down a steep hill to Riley Lake. Turn around at the intersection with trail #6 (no bikes allowed on 6). Head back using the main trail by turning left onto the fire road at km 7. A right turn onto the paved Pyramid Lake Road will lead you back down to Jasper. You’ll find the trailhead 20 km east of Jasper on Hwy 16. Look for the trailhead at the second parking lot when the highway crosses the Athabasca River. The trail parallels the river, which makes for great views. Close to the end of this trail you turn down a right-hand fork and cross a small creek (don’t worry, there’s a bridge). Continue on the edge of the river to the junction of the Maligne and Athabasca rivers at Sixth Bridge picnic area. 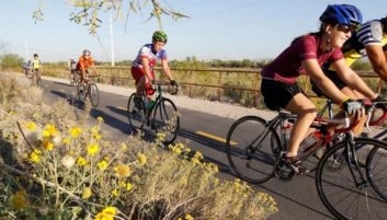 To get more info on biking the Rockies, check out the Col0rado Adventure Biker here.